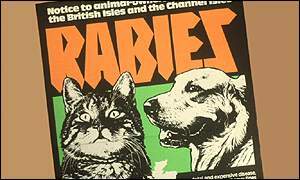 I've been obsessed with rabies since I was old enough to read, but not fully understand, the rabies poster in Woodingdean Library when I was a child. Rabies was a big deal in southern England at that time. The Channel Tunnel was in its last planning stages and some were worried it was going to prove little more than a superhighway for rabies, immigrants and rabid immigrants. Since the decline of the Empire, Britain has struggled to find things to be really proud of. It's easy to see why - the rapacious, brutal subjugation of hundreds of millions of fellow human beings because they come from another country is pretty hard to top. However, one such boast we Brits still enjoy is that we remain one of a handful of countries to not have any rabies. This has been bad news for the rabies poster industry. 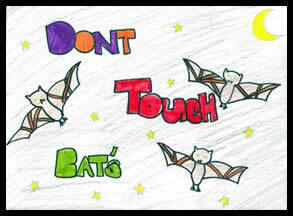 In the rest of the world, the rabies poster industry is among the top five in terms of annual turnover. In Colorado, schoolchildren have got into the act. But whilst their efforts are undeniably suffused with the heartfelt desire that less people get the rabies, this poster leaves something to be desired in terms of spelling and grammar. Careless spelling and grammar can cost lives, especially if you're so busy looking up the word "dont" in the dictionary that a mad raccoon sneaks up behind you. The poster which so affected me is one I have been unable to find online. I wish I had stolen it from the library now, although this would have been unwise from the point of view of how terrifying I found it. But it had lettering like the one pictured here, albeit illustrated with rather less sanguine and rather more rabid animals. I have decided to try and revive the great art of the rabies poster. I thought the best way to do this is to hold a competition. All you have to do to WIN TOP PRIZES* is draw an eye-catching and thought-provoking rabies poster for a new generation of Brits, a generation who've never even been tempted to give a badger the old stink eye. Size is very much up to you, the only stipulation is that they are all in portrait orientation, please. Closing date is the suitably spooky October 31st 2011. This is also the closing date for your paper tax returns. Extra credit will be given to someone who draws a rabies poster on their tax return. Please email your efforts to the address in the sidebar to the right of this. * I'll probably draw a picture of some animals who can get rabies or something. Was it a black cartoon dog, snarling into the poster? I remember "La Rage Tue" posters when I was in France affecting me similarly. Amusingly (?) my CAPTCHA is 'couga;. Humans can get it! Hydrophobia!